Beans and rice. What does that mean to you? Meager food? Hangover meal? Food you cook when you have no money? Side dish only? The year after I graduated college, I moved back to Seattle and lived at home. I got a crappy job – one that I certainly did not need my brand new shiny degree for, and tried to plug back into the Seattle scene after four years away. The advantages to living at home were many, not the least of which is that I got to eat my mom’s cooking. She has always been a good cook, but during the time I was away at college, she also converted to vegetarianism. It opened so many doors for her creativity and her food got really good. My mom is territorial in her kitchen, so I was not helping her prepare any meals, but I think I learned by osmosis. And I certainly learned to deeply appreciate the act of sitting around the table as a family and eating good, healthy, homemade food. Just as I found an apartment and was preparing to move out, my parents took a trip to Europe. My brother Michael, who is eight years younger than me, was still in high school and they asked that I stay with him and make sure he didn’t starve. At the same time, my college friend Darcie was visiting and another couple from college was coming through town as well. I realized that we all needed to eat and it was time to get in the kitchen. So I did what my mom always did. I got out her notebooks and cookbooks and spread them out on the table. I chose three dishes that sounded good to me and I wrote up my shopping list based on the ingredients needed. I shopped for the groceries and made the food, all the while being mildly surprised at how natural it all felt. I lived in Paris for a semester during college and cooked for myself, but it was just me and I made the same four things over and over. This time there was more responsibility and it came easily. More importantly, everyone loved the food. I realized that I could cook. That little boost of confidence is what got me on the path to loving food and loving cooking. I remember one of those first three dishes well and it starred black beans that had been simmered low and slow on the stove. Up until that point, I had not known that beans could taste that good or could be something I craved. The rest of the dish was a little odd so it did not stay in my repertoire, but I’ve been making similar beans ever since. I make a fair amount of Mexican food because both Randy and I love it. (In fact I am teaching Vegetarian Mexican Food class in March. Find out more here.) Whatever I make as a main, I always make beans because they are truly my favorite part of the meal. I have eaten my share of either boring or excessively greasy restaurant rice, so I enjoy making it more to my taste at home. Last week, I didn’t have the energy to take on burritos or enchiladas but really needed some beans and rice, so I made the rice heartier. It was my intention to roast two poblano peppers, chop them up, and use them in the rice, but mine had gone south. I wanted some kind of spicy bite so I opted for canned chiles instead. If you happen to have poblanos in your refrigerator (doesn’t everyone? ), I think they would be awesome here. Oh, and by the way, don’t forget to tell me what your favorite holiday gift was. You can win some awesome Vosges chocolate. Check it out here. Epazote is a delicious herb and can easily be found in the Penzey’s web site, but it is not necessary here. For the beans, you control their consistency. I like mine a little soupy but you can make yours drier by not adding as much water. Serve with guacamole and salsa. Preheat oven to 350ºF. Lightly oil an 8×8 glass or ceramic baking dish. In a large saucepan, melt the butter over medium heat. Add the onion and a large pinch of salt, and sauté for 5 minutes, until soft but not brown. Add the garlic cloves, oregano, epazote, and cumin and cook for 3 minutes, stirring often. Add the chiles and corn, and rice and give it a good stir to coat the grains with the fat and the vegetables. Pour in the water and bring to a boil. Turn the heat down to low, cover, and cook undisturbed for 20 minutes. Remove the cover, fluff the rice with a fork, then cover for another 5 minutes. Remove the cover and carefully stir in the cheese, sour cream, and cilantro, trying not to mush the rice too much. Taste for salt, adding more if necessary. Scrape the rice mixture into the prepared pan, cover with foil, and bake on the middle rack of the oven for 20 minutes. Heat a medium saucepan over medium heat. Drizzle in just enough oil to coat the bottom of the pan and then add the onions and red bell pepper plus a large pinch of salt. Sauté for 5 minutes, until soft but not brown, then add the garlic and the cumin. Cook for 3 minutes, stirring often. Add the beans and about ½ a cup of water and turn the heat to medium-low. Cook, stirring occasionally and adding more water as necessary, until the beans are hot and a bit soupy, about 20 minutes. Season to taste. Dana I am totally with you on this one. I am ALWAYS up for beans and rice. To me, they say absolutely delicious in every way. Even refried beans from the cheapest can that the supermarket has. Still delicious. I love how you’ve really doctored them up here and turned them into something anyone could feel proud to write home about! This looks so yummy and the very thing for supper this week – when all the Christmas leftovers have palled after being served for the xth time….Thanks so much for the inspiration. Hope all your boys are better or on the mend now. That sounds so delicious Dana. I never have rice and beans unless I am in a mexican restaurant, but I can see I am missing out. I have taking a note of this to try out. Thanks for the recipe and I hope you had fun on Christmas day. This really sounds wonderful, and I am always looking for a good excuse to visit Penzey’s. This is one of my favorite combos… although we usually eat it for breakfast with a fried egg and hot sauce on top. Beautiful picture, I can’t imagine it’s that easy to make beans and rice look so good! Thanks for the link to your cooking classes! I think I could live on beans and rice. I practically did when I was in school, and it’s still a favorite meal of mine. I love the hearty rice with the added veggies and cheese. Looks like a delicious meal! this looks absolutely AWESOME!!! 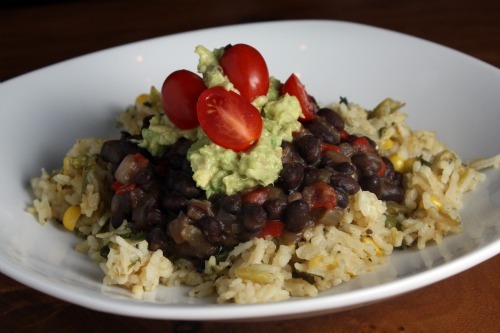 I just had something like this at Cafe Gratitude in SF- they topped it with a cashew cream and it was FAN-TAS-TIC. This is soo going in my rotation. To me beans and rice means “home.” I recently noted on my own food blog that even chili in the home where I grew up was served alongside white rice. My mom’s Colombian and rice was a part of every meal she had as a child. Her influence on me continues to be strong. All your concoctions are enticing but this one made me want to run to the stove and start cooking immediately! Thanks for another great post. I love beans and rice any which way. I ate it all the time when I was broke, but I still eat it because it’s a cupboard staple and it’s delicious. I’d love to try epazote! I’ll keep my eyes out for it. Beans and rice mean a pretty damn good meal to me!!!! Just had some tonight for dinner. Yum! I don’t eat vegetarian all the time, but we’ve been cutting more and more of the meat out of our diets lately. I love beans and rice and have made it in the past. I have never been completely satisfied with my recipe, though. I’m bookmarking this to give it a try soon! 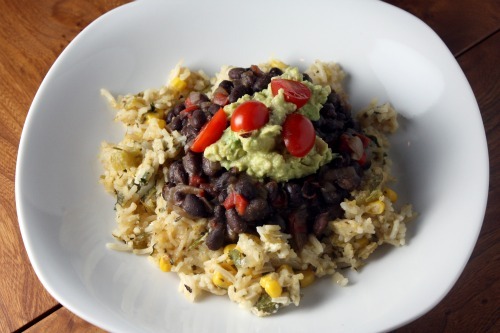 I’ve been traveling and I’m just catching up on blogs, but I had to chime in and say that I love black beans and rice. They are definitely a staple that we eat at least once a week. I’m glad to know that you share this love. I made this over the weekend and it was delicious. I added smoked sausage since we eat meat in our home and it was a hit all around! Thanks fro the great recipe!! Made this tonight. DE-licious! Thanks!